Tobacco smoking is the practice of smoking tobacco and inhaling tobacco smoke (consisting of particle and gaseous phases). (A more broad definition may include simply taking tobacco smoke into the mouth, and then releasing it, as is done by some with tobacco pipes and cigars.) The practice is believed to have begun as early as 5000–3000 BC in Mesoamerica and South America. Tobacco was introduced to Eurasia in the late 17th century by European colonists, where it followed common trade routes. The practice encountered criticism from its first import into the Western world onwards but embedded itself in certain strata of a number of societies before becoming widespread upon the introduction of automated cigarette-rolling apparatus. German scientists identified a link between smoking and lung cancer in the late 1920s, leading to the first anti-smoking campaign in modern history, albeit one truncated by the collapse of Nazi Germany at the end of World War II. In 1950, British researchers demonstrated a clear relationship between smoking and cancer. Evidence continued to mount in the 1980s, which prompted political action against the practice. Rates of consumption since 1965 in the developed world have either peaked or declined. However, they continue to climb in the developing world. Smoking is the most common method of consuming tobacco, and tobacco is the most common substance smoked. The agricultural product is often mixed with additives and then combusted. The resulting smoke is then inhaled and the active substances absorbed through the alveoli in the lungs or the oral mucosa. Combustion was traditionally enhanced by addition of potassium or nitrates. Many substances in cigarette smoke trigger chemical reactions in nerve endings, which heighten heart rate, alertness and reaction time, among other things. Dopamine and endorphins are released, which are often associated with pleasure. 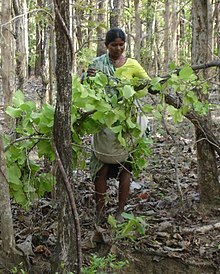 As of 2008 to 2010, tobacco is used by about 49% of men and 11% of women aged 15 or older in fourteen low-income and middle-income countries (Bangladesh, Brazil, China, Egypt, India, Mexico, Philippines, Poland, Russia, Thailand, Turkey, Ukraine, Uruguay and Vietnam), with about 80% of this usage in the form of smoking. The gender gap tends to be less pronounced in lower age groups. Many smokers begin during adolescence or early adulthood. During the early stages, a combination of perceived pleasure acting as positive reinforcement and desire to respond to social peer pressure may offset the unpleasant symptoms of initial use, which typically include nausea and coughing. After an individual has smoked for some years, the avoidance of withdrawal symptoms and negative reinforcement become the key motivations to continue. A study of first smoking experiences of seventh-grade students found out that the most common factor leading students to smoke is cigarette advertisements. Smoking by parents, siblings and friends also encourages students to smoke. 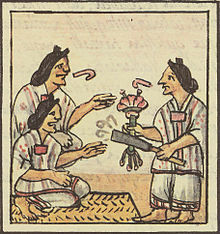 Aztec women are handed flowers and smoking tubes before eating at a banquet, Florentine Codex, 16th century. Smoking's history dates back to as early as 5000–3000 BC, when the agricultural product began to be cultivated in Mesoamerica and South America; consumption later evolved into burning the plant substance either by accident or with intent of exploring other means of consumption. The practice worked its way into shamanistic rituals. Many ancient civilizations – such as the Babylonians, the Indians, and the Chinese – burnt incense during religious rituals. Smoking in the Americas probably had its origins in the incense-burning ceremonies of shamans but was later adopted for pleasure or as a social tool. The smoking of tobacco and various hallucinogenic drugs was used to achieve trances and to come into contact with the spirit world. Also, to stimulate respiration, tobacco smoke enemas were used. Eastern North American tribes would carry large amounts of tobacco in pouches as a readily accepted trade item and would often smoke it in ceremonial pipes, either in sacred ceremonies or to seal bargains. Adults as well as children enjoyed the practice. It was believed that tobacco was a gift from the Creator and that the exhaled tobacco smoke was capable of carrying one's thoughts and prayers to heaven. Apart from smoking, tobacco had a number of uses as medicine. As a pain killer it was used for earache and toothache and occasionally as a poultice. Smoking was said by the desert Indians to be a cure for colds, especially if the tobacco was mixed with the leaves of the small Desert sage, Salvia dorrii, or the root of Indian balsam or cough root, Leptotaenia multifida, the addition of which was thought to be particularly good for asthma and tuberculosis. 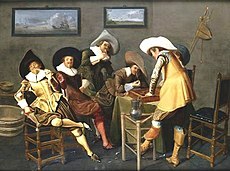 Gentlemen Smoking and Playing Backgammon in an Interior by Dirck Hals, 1627. In 1612, six years after the settlement of Jamestown, Virginia, John Rolfe was credited as the first settler to successfully raise tobacco as a cash crop. The demand quickly grew as tobacco, referred to as "brown gold", revived the Virginia joint stock company from its failed gold expeditions. In order to meet demands from the Old World, tobacco was grown in succession, quickly depleting the soil. This became a motivator to settle west into the unknown continent, and likewise an expansion of tobacco production. Indentured servitude became the primary labor force up until Bacon's Rebellion, from which the focus turned to slavery. This trend abated following the American Revolution as slavery became regarded as unprofitable. However, the practice was revived in 1794 with the invention of the cotton gin. Frenchman Jean Nicot (from whose name the word nicotine is derived) introduced tobacco to France in 1560, and tobacco then spread to England. The first report of a smoking Englishman is of a sailor in Bristol in 1556, seen "emitting smoke from his nostrils". Like tea, coffee and opium, tobacco was just one of many intoxicants that was originally used as a form of medicine. Tobacco was introduced around 1600 by French merchants in what today is modern-day Gambia and Senegal. At the same time, caravans from Morocco brought tobacco to the areas around Timbuktu, and the Portuguese brought the commodity (and the plant) to southern Africa, establishing the popularity of tobacco throughout all of Africa by the 1650s. Soon after its introduction to the Old World, tobacco came under frequent criticism from state and religious leaders. James VI and I, King of Scotland and England, produced the treatise A Counterblaste to Tobacco in 1604, and also introduced excise duty on the product. Murad IV, sultan of the Ottoman Empire 1623–40 was among the first to attempt a smoking ban by claiming it was a threat to public morals and health. The Chongzhen Emperor of China issued an edict banning smoking two years before his death and the overthrow of the Ming dynasty. Later, the Manchu rulers of the Qing dynasty, would proclaim smoking "a more heinous crime than that even of neglecting archery". In Edo period Japan, some of the earliest tobacco plantations were scorned by the shogunate as being a threat to the military economy by letting valuable farmland go to waste for the use of a recreational drug instead of being used to plant food crops. Bonsack's cigarette rolling machine, as shown on U.S. patent 238,640. Religious leaders have often been prominent among those who considered smoking immoral or outright blasphemous. In 1634, the Patriarch of Moscow forbade the sale of tobacco, and sentenced men and women who flouted the ban to have their nostrils slit and their backs flayed. Pope Urban VIII likewise condemned smoking on holy places in a papal bull of 1624. Despite some concerted efforts, restrictions and bans were largely ignored. When James I of England, a staunch anti-smoker and the author of A Counterblaste to Tobacco, tried to curb the new trend by enforcing a 4000% tax increase on tobacco in 1604 it was unsuccessful, as suggested by the presence of around 7,000 tobacco outlets in London by the early 17th century. From this point on for some centuries, several administrations withdrew from efforts at discouragement and instead turned tobacco trade and cultivation into sometimes lucrative government monopolies. By the mid-17th century most major civilizations had been introduced to tobacco smoking and in many cases had already assimilated it into the native culture, despite some continued attempts upon the parts of rulers to eliminate the practice with penalties or fines. Tobacco, both product and plant, followed the major trade routes to major ports and markets, and then on into the hinterlands. The English language term smoking appears to have entered currency in the late 18th century, before which less abbreviated descriptions of the practice such as drinking smoke were also in use. Growth in the US remained stable until the American Civil War in 1860s, when the primary agricultural workforce shifted from slavery to sharecropping. This, along with a change in demand, accompanied the industrialization of cigarette production as craftsman James Bonsack created a machine in 1881 to partially automate their manufacture. In Germany, anti-smoking groups, often associated with anti-liquor groups, first published advocacy against the consumption of tobacco in the journal Der Tabakgegner (The Tobacco Opponent) in 1912 and 1932. In 1929, Fritz Lickint of Dresden, Germany, published a paper containing formal statistical evidence of a lung cancer–tobacco link. During the Great Depression Adolf Hitler condemned his earlier smoking habit as a waste of money, and later with stronger assertions. This movement was further strengthened with Nazi reproductive policy as women who smoked were viewed as unsuitable to be wives and mothers in a German family. The anti-tobacco movement in Nazi Germany did not reach across enemy lines during the Second World War, as anti-smoking groups quickly lost popular support. By the end of the Second World War, American cigarette manufacturers quickly reentered the German black market. Illegal smuggling of tobacco became prevalent, and leaders of the Nazi anti-smoking campaign were silenced. As part of the Marshall Plan, the United States shipped free tobacco to Germany; with 24,000 tons in 1948 and 69,000 tons in 1949. Per capita yearly cigarette consumption in post-war Germany steadily rose from 460 in 1950 to 1,523 in 1963. By the end of the 20th century, anti-smoking campaigns in Germany were unable to exceed the effectiveness of the Nazi-era climax in the years 1939–41 and German tobacco health research was described by Robert N. Proctor as "muted". In 1950, Richard Doll published research in the British Medical Journal showing a close link between smoking and lung cancer. Beginning in December 1952, the magazine Reader's Digest published "Cancer by the Carton", a series of articles that linked smoking with lung cancer. In 1954, the British Doctors Study, a prospective study of some 40 thousand doctors for about 2.5 years, confirmed the suggestion, based on which the government issued advice that smoking and lung cancer rates were related. In January 1964, the United States Surgeon General's Report on Smoking and Health likewise began suggesting the relationship between smoking and cancer. As scientific evidence mounted in the 1980s, tobacco companies claimed contributory negligence as the adverse health effects were previously unknown or lacked substantial credibility. Health authorities sided with these claims up until 1998, from which they reversed their position. The Tobacco Master Settlement Agreement, originally between the four largest US tobacco companies and the Attorneys General of 46 states, restricted certain types of tobacco advertisement and required payments for health compensation; which later amounted to the largest civil settlement in United States history. Social campaigns have been instituted in many places to discourage smoking, such as Canada's National Non-Smoking Week. From 1965 to 2006, rates of smoking in the United States declined from 42% to 20.8%. The majority of those who quit were professional, affluent men. Although the per-capita number of smokers decreased, the average number of cigarettes consumed per person per day increased from 22 in 1954 to 30 in 1978. This paradoxical event suggests that those who quit smoked less, while those who continued to smoke moved to smoke more light cigarettes. The trend has been paralleled by many industrialized nations as rates have either leveled-off or declined. In the developing world, however, tobacco consumption continues to rise at 3.4% in 2002. In Africa, smoking is in most areas considered to be modern, and many of the strong adverse opinions that prevail in the West receive much less attention. Today Russia leads as the top consumer of tobacco followed by Indonesia, Laos, Ukraine, Belarus, Greece, Jordan, and China. Tobacco is an agricultural product processed from the fresh leaves of plants in the genus Nicotiana. The genus contains a number of species, however, Nicotiana tabacum is the most commonly grown. Nicotiana rustica follows as second containing higher concentrations of nicotine. These leaves are harvested and cured to allow for the slow oxidation and degradation of carotenoids in tobacco leaf. This produces certain compounds in the tobacco leaves which can be attributed to sweet hay, tea, rose oil, or fruity aromatic flavors. Before packaging, the tobacco is often combined with other additives in order to enhance the addictive potency, shift the products pH, or improve the effects of smoke by making it more palatable. In the United States these additives are regulated to 599 substances. The product is then processed, packaged, and shipped to consumer markets. Processed tobacco pressed into flakes for pipe smoking. Beedis are thin South Asian cigarettes filled with tobacco flakes and wrapped in a tendu leaf tied with a string at one end. They produce higher levels of carbon monoxide, nicotine, and tar than cigarettes typical in the United States. Cigars are tightly rolled bundles of dried and fermented tobacco which are ignited so that smoke may be drawn into the smoker's mouth. They are generally not inhaled because of the high alkalinity of the smoke, which can quickly become irritating to the trachea and lungs. The prevalence of cigar smoking varies depending on location, historical period, and population surveyed, and prevalence estimates vary somewhat depending on the survey method. The United States is the top consuming country by far, followed by Germany and the United Kingdom; the US and Western Europe account for about 75% of cigar sales worldwide. As of 2005 it is estimated that 4.3% of men and 0.3% of women smoke cigars in the USA. Cigarettes, French for "small cigar", are a product consumed through smoking and manufactured out of cured and finely cut tobacco leaves and reconstituted tobacco, often combined with other additives, which are then rolled or stuffed into a paper-wrapped cylinder. Cigarettes are ignited and inhaled, usually through a cellulose acetate filter, into the mouth and lungs. Hookah are a single or multi-stemmed (often glass-based) water pipe for smoking. Originally from India. The hookah was a symbol of pride and honor for the landlords, kings and other such high class people. Now, the hookah has gained immense popularity, especially in the Middle East. A hookah operates by water filtration and indirect heat. It can be used for smoking herbal fruits, tobacco, or cannabis. Kretek are cigarettes made with a complex blend of tobacco, cloves and a flavoring "sauce". It was first introduced in the 1880s in Kudus, Java, to deliver the medicinal eugenol of cloves to the lungs. The quality and variety of tobacco play an important role in kretek production, from which kretek can contain more than 30 types of tobacco. Minced dried clove buds weighing about one-third of the tobacco blend are added to add flavoring. In 2004 the United States prohibited cigarettes from having a "characterizing flavor" of certain ingredients other than tobacco and menthol, thereby removing kretek from being classified as cigarettes. Passive smoking is the usually involuntary consumption of smoked tobacco. Second-hand smoke (SHS) is the consumption where the burning end is present, environmental tobacco smoke (ETS) or third-hand smoke is the consumption of the smoke that remains after the burning end has been extinguished. Because of its negative implications, this form of consumption has played a central role in the regulation of tobacco products. Pipe smoking typically consists of a small chamber (the bowl) for the combustion of the tobacco to be smoked and a thin stem (shank) that ends in a mouthpiece (the bit). Shredded pieces of tobacco are placed into the chamber and ignited. Roll-your-own or hand-rolled cigarettes, often called "rollies", "cigi" or "Roll-ups", are very popular particularly in European countries and the UK. These are prepared from loose tobacco, cigarette papers, and filters all bought separately. They are usually much cheaper than ready-made cigarettes and small contraptions can be bought making the process easier. A vaporizer is a device used to sublimate the active ingredients of plant material. Rather than burning the herb, which produces potentially irritating, toxic, or carcinogenic by-products; a vaporizer heats the material in a partial vacuum so that the active compounds contained in the plant boil off into a vapor. This method is often preferable when medically administrating the smoke substance, as opposed to directly pyrolyzing the plant material. A graph that shows the efficiency of smoking as a way to absorb nicotine compared to other forms of intake. The active substances in tobacco, especially cigarettes, are administered by burning the leaves and inhaling the vaporized gas that results. This quickly and effectively delivers substances into the bloodstream by absorption through the alveoli in the lungs. The lungs contain some 300 million alveoli, which amounts to a surface area of over 70 m2 (about the size of a tennis court). This method is not completely efficient as not all of the smoke will be inhaled, and some amount of the active substances will be lost in the process of combustion, pyrolysis. Pipe and Cigar smoke are not inhaled because of its high alkalinity, which are irritating to the trachea and lungs. However, because of its higher alkalinity (pH 8.5) compared to cigarette smoke (pH 5.3), non-ionized nicotine is more readily absorbed through the mucous membranes in the mouth. Nicotine absorption from cigar and pipe, however, is much less than that from cigarette smoke. Nicotine and cocaine activate similar patterns of neurons, which supports the existence of common substrates among these drugs. The inhaled nicotine mimics nicotinic acetylcholine which when bound to nicotinic acetylcholine receptors prevents the reuptake of acetylcholine thereby increasing that neurotransmitter in those areas of the body. These nicotinic acetylcholine receptors are located in the central nervous system and at the nerve-muscle junction of skeletal muscles; whose activity increases heart rate, alertness, and faster reaction times. Nicotine acetylcholine stimulation is not directly addictive. However, since dopamine-releasing neurons are abundant on nicotine receptors, dopamine is released; and, in the nucleus accumbens, dopamine is associated with motivation causing reinforcing behavior. Dopamine increase, in the prefrontal cortex, may also increase working memory. When tobacco is smoked, most of the nicotine is pyrolyzed. However, a dose sufficient to cause mild somatic dependency and mild to strong psychological dependency remains. There is also a formation of harmane (a MAO inhibitor) from the acetaldehyde in tobacco smoke. This may play a role in nicotine addiction, by facilitating a dopamine release in the nucleus accumbens as a response to nicotine stimuli. Using rat studies, withdrawal after repeated exposure to nicotine results in less responsive nucleus accumbens cells, which produce dopamine responsible for reinforcement. Percentage of males smoking any tobacco product. Note that there is a difference between the scales used for females and the scales used for males. As of 2000, smoking was practiced by around 1.22 billion people. At current rates of 'smoker replacement' and market growth, this may reach around 1.9 billion in 2025. Smoking may be up to five times more prevalent among men than women in some communities, although the gender gap usually declines with younger age. In some developed countries smoking rates for men have peaked and begun to decline, while for women they continue to climb. As of 2002, about twenty percent of young teenagers (13–15) smoked worldwide. 80,000 to 100,000 children begin smoking every day, roughly half of whom live in Asia. Half of those who begin smoking in adolescent years are projected to go on to smoke for 15 to 20 years. The World Health Organization (WHO) states that "Much of the disease burden and premature mortality attributable to tobacco use disproportionately affect the poor". Of the 1.22 billion smokers, 1 billion of them live in developing or transitional economies. Rates of smoking have leveled off or declined in the developed world. In the developing world, however, tobacco consumption is rising by 3.4% per year as of 2002. The WHO in 2004 projected 58.8 million deaths to occur globally, from which 5.4 million are tobacco-attributed, and 4.9 million as of 2007. As of 2002, 70% of the deaths are in developing countries. As of 2017, smoking causes one in ten deaths worldwide, with half of those deaths in the US, China, India and Russia. Most smokers begin smoking during adolescence or early adulthood. Some studies also show that smoking can also be linked to various mental health complications. Smoking has elements of risk-taking and rebellion, which often appeal to young people. The presence of peers that smoke and media featuring high-status models smoking may also encourage smoking. Because teenagers are influenced more by their peers than by adults, attempts by parents, schools, and health professionals at preventing people from trying cigarettes are often unsuccessful. Children of smoking parents are more likely to smoke than children with non-smoking parents. Children of parents who smoke are less likely to quit smoking. One study found that parental smoking cessation was associated with less adolescent smoking, except when the other parent currently smoked. A current study tested the relation of adolescent smoking to rules regulating where adults are allowed to smoke in the home. Results showed that restrictive home smoking policies were associated with lower likelihood of trying smoking for both middle and high school students. Behavioural research generally indicates that teenagers begin their smoking habits due to peer pressure, and cultural influence portrayed by friends. However, one study found that direct pressure to smoke cigarettes played a less significant part in adolescent smoking, with adolescents also reporting low levels of both normative and direct pressure to smoke cigarettes. Mere exposure to tobacco retailers may motivate smoking behaviour in adults. A similar study suggested that individuals may play a more active role in starting to smoke than has previously been thought and that social processes other than peer pressure also need to be taken into account. Another study's results indicated that peer pressure was significantly associated with smoking behavior across all age and gender cohorts, but that intrapersonal factors were significantly more important to the smoking behavior of 12- to 13-year-old girls than same-age boys. Within the 14- to 15-year-old age group, one peer pressure variable emerged as a significantly more important predictor of girls' than boys' smoking. It is debated whether peer pressure or self-selection is a greater cause of adolescent smoking. Psychologists such as Hans Eysenck have developed a personality profile for the typical smoker. Extraversion is the trait that is most associated with smoking, and smokers tend to be sociable, impulsive, risk taking, and excitement seeking individuals. Although personality and social factors may make people likely to smoke, the actual habit is a function of operant conditioning. During the early stages, smoking provides pleasurable sensations (because of its action on the dopamine system) and thus serves as a source of positive reinforcement. The reasons given by some smokers for this activity have been categorized as addictive smoking, pleasure from smoking, tension reduction/relaxation, social smoking, stimulation, habit/automatism, and handling. There are gender differences in how much each of these reasons contribute, with females more likely than males to cite tension reduction/relaxation, stimulation and social smoking. Some smokers argue that the depressant effect of smoking allows them to calm their nerves, often allowing for increased concentration. However, according to the Imperial College London, "Nicotine seems to provide both a stimulant and a depressant effect, and it is likely that the effect it has at any time is determined by the mood of the user, the environment and the circumstances of use. Studies have suggested that low doses have a depressant effect, while higher doses have stimulant effect." A number of studies have established that cigarette sales and smoking follow distinct time-related patterns. For example, cigarette sales in the United States of America have been shown to follow a strongly seasonal pattern, with the high months being the months of summer, and the low months being the winter months. Similarly, smoking has been shown to follow distinct circadian patterns during the waking day—with the high point usually occurring shortly after waking in the morning, and shortly before going to sleep at night. In countries where there is a universally funded healthcare system, the government covers the cost of medical care for smokers who become ill through smoking in the form of increased taxes. Two broad debating positions exist on this front, the "pro-smoking" argument suggesting that heavy smokers generally don't live long enough to develop the costly and chronic illnesses which affect the elderly, reducing society's healthcare burden, and the "anti-smoking" argument suggests that the healthcare burden is increased because smokers get chronic illnesses younger and at a higher rate than the general population. Data on both positions has been contested. The Centers for Disease Control and Prevention published research in 2002 claiming that the cost of each pack of cigarettes sold in the United States was more than $7 in medical care and lost productivity. The cost may be higher, with another study putting it as high as $41 per pack, most of which however is on the individual and his/her family. This is how one author of that study puts it when he explains the very low cost for others: "The reason the number is low is that for private pensions, Social Security, and Medicare — the biggest factors in calculating costs to society — smoking actually saves money. Smokers die at a younger age and don't draw on the funds they've paid into those systems." Other research demonstrates that premature death caused by smoking may redistribute Social Security income in unexpected ways that affect behavior and reduce the economic well-being of smokers and their dependents. To further support this, whatever the rate of smoking consumption is per day, smokers have a greater lifetime medical cost on average compared to a non-smoker by an estimated $6000 Between the cost for lost productivity and health care expenditures combined, cigarette smoking costs at least 193 billion dollars (Research also shows that smokers earn less money than nonsmokers). As for secondhand smoke, the cost is over 10 billion dollars. By contrast, some non-scientific studies, including one conducted by Philip Morris in the Czech Republic called Public Finance Balance of Smoking in the Czech Republic and another by the Cato Institute, support the opposite position. Philip Morris has explicitly apologised for the former study, saying: "The funding and public release of this study which, among other things, detailed purported cost savings to the Czech Republic due to premature deaths of smokers, exhibited terrible judgment as well as a complete and unacceptable disregard of basic human values. For one of our tobacco companies to commission this study was not just a terrible mistake, it was wrong. All of us at Philip Morris, no matter where we work, are extremely sorry for this. No one benefits from the very real, serious and significant diseases caused by smoking." Between 1970 and 1995, per-capita cigarette consumption in poorer developing countries increased by 67 percent, while it dropped by 10 percent in the richer developed world. Eighty percent of smokers now live in less developed countries. By 2030, the World Health Organization (WHO) forecasts that 10 million people a year will die of smoking-related illness, making it the single biggest cause of death worldwide, with the largest increase to be among women. WHO forecasts the 21st century's death rate from smoking to be ten times the 20th century's rate ("Washingtonian" magazine, December 2007). Cigarette smoking is the leading cause of preventable death and a major public health concern. There are 1.1 billion tobacco users in the world. One person dies every six seconds from a tobacco related disease. Common adverse effects of tobacco smoking. The more common effects are in bold face. Tobacco use leads most commonly to diseases affecting the heart and lungs, with smoking being a major risk factor for heart attacks, strokes, chronic obstructive pulmonary disease (COPD), Idiopathic Pulmonary Fibrosis (IPF), emphysema, and cancer (particularly lung cancer, cancers of the larynx and mouth, esophageal cancer and pancreatic cancer). Cigarette smoking increases the risk of Crohn's disease as well as the severity of the course of the disease. It is also the number one cause of bladder cancer. The smoke from tobacco elicits carcinogenic effects on the tissues of the body that are exposed to the smoke. Tobacco smoke is a complex mixture of over 5,000 identified chemicals, of which 98 are known to have specific toxicological properties. The most important chemicals causing cancer are those that produce DNA damage since such damage appears to be the primary underlying cause of cancer. Cunningham et al. combined the microgram weight of the compound in the smoke of one cigarette with the known genotoxic effect per microgram to identify the most carcinogenic compounds in cigarette smoke. The seven most important carcinogens in tobacco smoke are shown in the table, along with DNA alterations they cause. Cigarette smoking has also been associated with sarcopenia, the age-related loss of muscle mass and strength. The World Health Organization estimates that tobacco caused 5.4 million deaths in 2004 and 100 million deaths over the course of the 20th century. Similarly, the United States Centers for Disease Control and Prevention describes tobacco use as "the single most important preventable risk to human health in developed countries and an important cause of premature death worldwide." Although 70% of smokers state their intention to quit only 3–5% are actually successful in doing so. The probabilities of death from lung cancer before age 75 in the United Kingdom are 0.2% for men who never smoked (0.4% for women), 5.5% for male former smokers (2.6% in women), 15.9% for current male smokers (9.5% for women) and 24.4% for male "heavy smokers" defined as smoking more than 5 cigarettes per day (18.5% for women). Tobacco smoke can combine with other carcinogens present within the environment in order to produce elevated degrees of lung cancer. Rates of smoking have generally leveled-off or declined in the developed world. Smoking rates in the United States have dropped by half from 1965 to 2006, falling from 42% to 20.8% in adults. In the developing world, tobacco consumption is rising by 3.4% per year. Second-hand smoke presents a known health risk, to which six hundred thousand deaths were attributed in 2004. It also has been known to produce skin conditions such as freckles and dryness. In 2015, a meta-analysis found that smokers were at greater risk of developing psychotic illness. Tobacco has also been described an anaphrodisiac due to its propensity for causing erectile dysfunction. Famous smokers of the past used cigarettes or pipes as part of their image, such as Jean-Paul Sartre's Gauloises-brand cigarettes; Albert Einstein's, Douglas MacArthur's, Bertrand Russell's, and Bing Crosby's pipes; or the news broadcaster Edward R. Murrow's cigarette. Writers in particular seem to be known for smoking, for example, Cornell Professor Richard Klein's book Cigarettes are Sublime for the analysis, by this professor of French literature, of the role smoking plays in 19th and 20th century letters. The popular author Kurt Vonnegut addressed his addiction to cigarettes within his novels. British Prime Minister Harold Wilson was well known for smoking a pipe in public as was Winston Churchill for his cigars. Sherlock Holmes, the fictional detective created by Sir Arthur Conan Doyle smoked a pipe, cigarettes, and cigars. The DC Vertigo comic book character, John Constantine, created by Alan Moore, is synonymous with smoking, so much so that the first storyline by Preacher creator, Garth Ennis, centered around John Constantine contracting lung cancer. Professional wrestler James Fullington, while in character as "The Sandman", is a chronic smoker in order to appear "tough". The problem of smoking at home is particularly difficult for women in many cultures (especially Arab cultures), where it may not be acceptable for a woman to ask her husband not to smoke at home or in the presence of her children. Studies have shown that pollution levels for smoking areas indoors are higher than levels found on busy roadways, in closed motor garages, and during fire storms. [clarification needed] Furthermore, smoke can spread from one room to another, even if doors to the smoking area are closed. The ceremonial smoking of tobacco, and praying with a sacred pipe, is a prominent part of the religious ceremonies of a number of Native American Nations. Sema, the Anishinaabe word for tobacco, is grown for ceremonial use and considered the ultimate sacred plant since its smoke is believed to carry prayers to the spirits. In most major religions, however, tobacco smoking is not specifically prohibited, although it may be discouraged as an immoral habit. Before the health risks of smoking were identified through controlled study, smoking was considered an immoral habit by certain Christian preachers and social reformers. The founder of the Latter Day Saint movement, Joseph Smith, recorded that on 27 February 1833, he received a revelation which discouraged tobacco use. This "Word of Wisdom" was later accepted as a commandment, and faithful Latter-day Saints abstain completely from tobacco. Jehovah's Witnesses base their stand against smoking on the Bible's command to "clean ourselves of every defilement of flesh" (2 Corinthians 7:1). The Jewish Rabbi Yisrael Meir Kagan (1838–1933) was one of the first Jewish authorities to speak out on smoking. In Ahmadiyya Islam, smoking is highly discouraged, although not forbidden. During the month of fasting however, it is forbidden to smoke tobacco. In the Bahá'í Faith, smoking tobacco is discouraged though not forbidden. One of the largest global enterprises in the world is known to be the tobacco industry. The six biggest tobacco companies made a combined profit of $35.1 billion (Jha et al., 2014) in 2010. On 27 February 2005 the WHO Framework Convention on Tobacco Control, took effect. The FCTC is the world's first public health treaty. Countries that sign on as parties agree to a set of common goals, minimum standards for tobacco control policy, and to cooperate in dealing with cross-border challenges such as cigarette smuggling. Currently the WHO declares that 4 billion people will be covered by the treaty, which includes 168 signatories. Among other steps, signatories are to put together legislation that will eliminate secondhand smoke in indoor workplaces, public transport, indoor public places and, as appropriate, other public places. Many governments have introduced excise taxes on cigarettes in order to reduce the consumption of cigarettes. In 2002, the Centers for Disease Control and Prevention said that each pack of cigarettes[quantify] sold in the United States costs the nation more than $7 in medical care and lost productivity, around $3400 per year per smoker. Another study by a team of health economists finds the combined price paid by their families and society is about $41 per pack of cigarettes. Substantial scientific evidence shows that higher cigarette prices result in lower overall cigarette consumption. Most studies indicate that a 10% increase in price will reduce overall cigarette consumption by 3% to 5%. Youth, minorities, and low-income smokers are two to three times more likely to quit or smoke less than other smokers in response to price increases. Smoking is often cited as an example of an inelastic good, however, i.e. a large rise in price will only result in a small decrease in consumption. Many nations have implemented some form of tobacco taxation. As of 1997, Denmark had the highest cigarette tax burden of $4.02 per pack. Taiwan only had a tax burden of $0.62 per pack. The federal government of the United States charges $1.01 per pack. Cigarette taxes vary widely from state to state in the United States. For example, Missouri has a cigarette tax of only 17 cents per pack, the nation's lowest, while New York has the highest cigarette tax in the U.S.: $4.35 per pack. In Alabama, Illinois, Missouri, New York City, Tennessee, and Virginia, counties and cities may impose an additional limited tax on the price of cigarettes. Sales taxes are also levied on tobacco products in most jurisdictions. In the United Kingdom, a packet of 20 cigarettes typically costs between £8.00 to £12.00 according to 2018 prices, depending on the brand purchased and where the purchase was made. The UK has a significant black market for tobacco, and it has been estimated by the tobacco industry that 27% of cigarette and 68% of handrolling tobacco consumption is non-UK duty paid (NUKDP). In Australia total taxes account for 62.5% of the final price of a packet of cigarettes (2011 figures). These taxes include federal excise or customs duty and Goods and Services Tax. An enclosed smoking area in a Japanese train station. Notice the air vent on the roof. In June 1967, the US Federal Communications Commission ruled that programmes broadcast on a television station which discussed smoking and health were insufficient to offset the effects of paid advertisements that were broadcast for five to ten minutes each day. In April 1970, the US Congress passed the Public Health Cigarette Smoking Act banning the advertising of cigarettes on television and radio starting on 2 January 1971. The Tobacco Advertising Prohibition Act 1992 expressly prohibited almost all forms of Tobacco advertising in Australia, including the sponsorship of sporting or other cultural events by cigarette brands. All tobacco advertising and sponsorship on television has been banned within the European Union since 1991 under the Television Without Frontiers Directive (1989). This ban was extended by the Tobacco Advertising Directive, which took effect in July 2005 to cover other forms of media such as the internet, print media, and radio. The directive does not include advertising in cinemas and on billboards or using merchandising – or tobacco sponsorship of cultural and sporting events which are purely local, with participants coming from only one Member State as these fall outside the jurisdiction of the European Commission. However, most member states have transposed the directive with national laws that are wider in scope than the directive and cover local advertising. A 2008 European Commission report concluded that the directive had been successfully transposed into national law in all EU member states, and that these laws were well implemented. Some countries also impose legal requirements on the packaging of tobacco products. For example, in the countries of the European Union, Turkey, Australia and South Africa, cigarette packs must be prominently labeled with the health risks associated with smoking. Canada, Australia, Thailand, Iceland and Brazil have also imposed labels upon cigarette packs warning smokers of the effects, and they include graphic images of the potential health effects of smoking. Cards are also inserted into cigarette packs in Canada. There are sixteen of them, and only one comes in a pack. They explain different methods of quitting smoking. Also, in the United Kingdom, there have been a number of graphic NHS advertisements, one showing a cigarette filled with fatty deposits, as if the cigarette is symbolizing the artery of a smoker. Many countries have a smoking age. In many countries, including the United States, most European Union member states, New Zealand, Canada, South Africa, Israel, India, Brazil, Chile, Costa Rica and Australia, it is illegal to sell tobacco products to minors and in the Netherlands, Austria, Belgium, Denmark and South Africa it is illegal to sell tobacco products to people under the age of 16. On 1 September 2007 the minimum age to buy tobacco products in Germany rose from 16 to 18, as well as in the United Kingdom where on 1 October 2007 it rose from 16 to 18. Underlying such laws is the belief that people should make an informed decision regarding the risks of tobacco use. These laws have a lax enforcement in some nations and states. In China, Turkey, and many other countries usually a child will have little problem buying tobacco products, because they are often told to go to the store to buy tobacco for their parents. Several countries such as Ireland, Latvia, Estonia, the Netherlands, Finland, Norway, Canada, Australia, Sweden, Portugal, Singapore, Italy, Indonesia, India, Lithuania, Chile, Spain, Iceland, United Kingdom, Slovenia, Turkey and Malta have legislated against smoking in public places, often including bars and restaurants. Restaurateurs have been permitted in some jurisdictions to build designated smoking areas (or to prohibit smoking). In the United States, many states prohibit smoking in restaurants, and some also prohibit smoking in bars. In provinces of Canada, smoking is illegal in indoor workplaces and public places, including bars and restaurants. As of 31 March 2008 Canada has introduced a smoke-free law ban in all public places, as well as within 10 metres of an entrance to any public place. In Australia, smoke-free laws vary from state to state. Currently, Queensland has completely smoke-free indoor public places (including workplaces, bars, pubs and eateries) as well as patrolled beaches and some outdoor public areas. There are, however, exceptions for designated smoking areas. In Victoria, smoking is restricted in railway stations, bus stops and tram stops as these are public locations where second-hand smoke can affect non-smokers waiting for public transport, and since 1 July 2007 is now extended to all indoor public places. In New Zealand and Brazil, smoking is restricted in enclosed public places including bars, restaurants and pubs. Hong Kong restricted smoking on 1 January 2007 in the workplace, public spaces such as restaurants, karaoke rooms, buildings, and public parks (bars which do not admit minors were exempt until 2009). In Romania smoking is illegal in trains, metro stations, public institutions (except where designated, usually outside) and public transport. In Germany, additionally to smoking bans in public buildings and transports, an anti-smoking ordinance for bars and restaurants was implemented in late 2007. A study by the University of Hamburg (Ahlfeldt and Maennig 2010) demonstrates, that the smoking ban had, if any, only short run impacts on bar and restaurant revenues. In the medium and long run no negative effect was measurable. The results suggest either, that the consumption in bars and restaurants is not affected by smoking bans in the long run, or, that negative revenue impacts by smokers are compensated by increasing revenues through non-smokers. An indirect public health problem posed by cigarettes is that of accidental fires, usually linked with consumption of alcohol. Enhanced combustion using nitrates was traditionally used but cigarette manufacturers have been silent on this subject claiming at first that a safe cigarette was technically impossible, then that it could only be achieved by modifying the paper. Roll your own cigarettes contain no additives and are fire safe. Numerous fire safe cigarette designs have been proposed, some by tobacco companies themselves, which would extinguish a cigarette left unattended for more than a minute or two, thereby reducing the risk of fire. Among American tobacco companies, some have resisted this idea, while others have embraced it. RJ Reynolds was a leader in making prototypes of these cigarettes in 1983 and will make all of their U.S. market cigarettes to be fire-safe by 2010. Phillip Morris is not in active support of it. Lorillard (purchased by RJ Reynolds), the US' 3rd-largest tobacco company, seems to be ambivalent. The relationship between tobacco and other drug use has been well-established, however the nature of this association remains unclear. The two main theories are the phenotypic causation (gateway) model and the correlated liabilities model. The causation model argues that smoking is a primary influence on future drug use, while the correlated liabilities model argues that smoking and other drug use are predicated on genetic or environmental factors. Smoking cessation, referred to as "quitting", is the action leading towards abstinence of tobacco smoking. Methods of "quitting" include advice from physicians or social workers, cold turkey, nicotine replacement therapy, contingent vouchers, antidepressants, hypnosis, self-help (mindfulness meditation), and support groups. A meta-analysis from 2018, conducted on 61 RCT, showed that one year after people quit smoking with the assistance of first‐line smoking cessation medications (and some behavioral help), only a little under 20% of smokers remained sustained abstinence. ^ a b Gately, Iain (2004) . Tobacco: A Cultural History of How an Exotic Plant Seduced Civilization. Diane. pp. 3–7. ISBN 978-0-8021-3960-3. Retrieved 22 March 2009. ^ a b c Lloyd, John; Mitchinson, John (25 July 2008). "The Book of General Ignorance". Harmony Books. ISBN 978-0-307-39491-0. ^ West, Robert; Shiffman, Saul (2007). Fast Facts: Smoking Cessation. Health Press Ltd. p. 28. ISBN 978-1-903734-98-8. ^ a b Doll, R.; Hill, B. (June 2004). "The mortality of doctors in relation to their smoking habits: a preliminary report: (Reprinted from Br Med J 1954:ii;1451-5)". BMJ (Clinical Research Ed.). 328 (7455): 1529–1533, discussion 1533. doi:10.1136/bmj.328.7455.1529. ISSN 0959-8138. PMC 437141. PMID 15217868. ^ a b c d "WHO/WPRO-Smoking Statistics". World Health Organization Regional Office for the Western Pacific. 28 May 2002. Archived from the original on 8 November 2009. Retrieved 1 January 2009. ^ a b c Wigand, Jeffrey S. (July 2006). "ADDITIVES, CIGARETTE DESIGN and TOBACCO PRODUCT REGULATION" (PDF). Mt. Pleasant, MI 48804: Jeffrey Wigand. Retrieved 14 February 2009. ^ a b Parrott, A. C.; Winder, G. (1989). "Nicotine chewing gum (2 mg, 4 mg) and cigarette smoking: comparative effects upon vigilance and heart rate". Psychopharmacology. 97 (2): 257–261. doi:10.1007/BF00442260. PMID 2498936. ^ a b Parkin, C.; Fairweather, D. B.; Shamsi, Z.; Stanley, N.; Hindmarch, I. (1998). "The effects of cigarette smoking on overnight performance". Psychopharmacology. 136 (2): 172–178. doi:10.1007/s002130050553. PMID 9551774. ^ a b "Surgeon General's Report—Women and Smoking". Centers for Disease Control and Prevention. 2001. p. 47. Retrieved 3 January 2009. ^ a b c d e f Chandrupatla, Siddardha G.; Tavares, Mary; Natto, Zuhair S. (27 July 2017). "Tobacco Use and Effects of Professional Advice on Smoking Cessation among Youth in India". Asian Pacific Journal of Cancer Prevention: APJCP. 18 (7): 1861–1867. doi:10.22034/APJCP.2017.18.7.1861. ISSN 2476-762X. PMC 5648391. PMID 28749122. ^ The Lancet (26 September 2009). "Tobacco smoking:why start?". The Lancet. 374 (9695): 1038. doi:10.1016/s0140-6736(09)61680-9. ^ Wilbert, Johannes (28 July 1993). "Tobacco and Shamanism in South America". Yale University Press. ISBN 978-0-300-05790-4. Retrieved 22 March 2009. ^ Robicsek, Francis (January 1979). "The Smoking Gods: Tobacco in Maya Art, History, and Religion". University of Oklahoma Press: 30. ISBN 978-0-8061-1511-5. ^ F.J.Carod-Artal (1 July 2011). "Hallucinogenic drugs in pre-Columbian Mesoamerican cultures". Neurología. Science Direct. Retrieved 30 March 2019. ^ Heckewelder, John Gottlieb Ernestus; Reichel, William Cornelius (June 1971) . "History, manners, and customs of the Indian nations who once inhabited Pennsylvania and the neighboring states" (PDF). The Historical society of Pennsylvania: 149. ISBN 978-0-405-02853-3. Retrieved 22 March 2009. ^ Balls, Edward K. (1 October 1962). "Early Uses of California Plants". University of California Press: 81–85. ISBN 978-0-520-00072-8. Retrieved 22 March 2009. ^ Jordan, Jr., Ervin L. "Jamestown, Virginia, 1607–1907: An Overview". University of Virginia. Archived from the original on 17 October 2002. Retrieved 22 February 2009. ^ Kulikoff, Allan (1 August 1986). "Tobacco and Slaves: The Development of Southern Cultures in the Chesapeake". The University of North Carolina Press. ISBN 978-0-8078-4224-9. Retrieved 22 March 2009. ^ Cooper, William James (October 2000). "Liberty and Slavery: Southern Politics to 1860". Univ of South Carolina Press: 9. ISBN 978-1-57003-387-2. Retrieved 22 March 2009. ^ Trager, James (August 1994). "The People's Chronology: A Year-by-year Record of Human Events from Prehistory to the Present". Holt. ISBN 978-0-8050-3134-8. ^ King James I of England (16 April 2002) . "A Counterblaste to Tobacco". University of Texas at Austin. Retrieved 22 March 2009. ^ Burns, Eric (28 September 2006). "The Smoke of the Gods: A Social History of Tobacco". Temple University Press: 134–135. ISBN 978-1-59213-480-9. Retrieved 22 March 2009. ^ Proctor, Robert N. (1996). "Nazi Medicine and Public Health Policy". Dimensions. Anti-Defamation League. 10 (2). Archived from the original on 5 December 2012. Retrieved 1 October 2018 – via archived copy at archive.is. ^ Doll, R.; Hill, A. B. (1 September 1950). "Smoking and Carcinoma of the Lung". British Medical Journal. 2 (4682): 739–748. doi:10.1136/bmj.2.4682.739. ISSN 0007-1447. PMC 2038856. PMID 14772469. ^ "CNN Interactive". Cnn.com. Retrieved 22 June 2009. ^ "The Reports of the Surgeon General: The 1964 Report on Smoking and Health". Profiles in Science. United States National Library of Medicine, National Institutes of Health. Retrieved 10 October 2015. ^ Milo Geyelin (23 November 1998). "Forty-Six States Agree to Accept $206 Billion Tobacco Settlement". Wall Street Journal. ^ Hilton, Matthew (4 May 2000). "Smoking in British Popular Culture, 1800–2000: Perfect Pleasures". Manchester University Press: 229–241. ISBN 978-0-7190-5257-6. Retrieved 22 March 2009. ^ "Bidi Use Among Urban Youth – Massachusetts, March–April 1999". Centers for Disease Control and Prevention. 17 September 1999. Retrieved 14 February 2009. ^ Pakhale, S. M.; Maru, G. B. (December 1998). "Distribution of major and minor alkaloids in tobacco, mainstream and sidestream smoke of popular Indian smoking products". Food and Chemical Toxicology. 36 (12): 1131–1138. doi:10.1016/S0278-6915(98)00071-4. ISSN 0278-6915. PMID 9862656. ^ Rarick CA (2 April 2008). "Note on the premium cigar industry". SSRN 1127582. ^ Mariolis P, Rock VJ, Asman K, et al. (2006). "Tobacco use among adults—United States, 2005". MMWR Morb Mortal Wkly Rep. 55 (42): 1145–8. PMID 17065979. ^ "A bill to protect the public health by providing the Food and Drug Administration with certain authority to regulate tobacco products. (Summary)" (Press release). Library of Congress. 20 May 2004. Retrieved 1 August 2007. ^ Turner, JA; Sillett, RW; McNicol, MW (1977). "Effect of cigar smoking on carboxyhemoglobin and plasma nicotine concentrations in primary pipe and cigar smokers and ex-cigarette smokers". British Medical Journal. 2 (6099): 1387–9. doi:10.1136/bmj.2.6099.1387. PMC 1632361. PMID 589225. ^ Armitage, A. K.; Turner, D. M. (1970). "Absorption of Nicotine in Cigarette and Cigar Smoke through the Oral Mucosa". Nature. 226 (5252): 1231–1232. Bibcode:1970Natur.226.1231A. doi:10.1038/2261231a0. PMID 5422597. ^ Pich, E. M.; Pagliusi, S. R.; Tessari, M.; Talabot-Ayer, D.; Hooft Van Huijsduijnen, R.; Chiamulera, C. (1997). "Common neural substrates for the addictive properties of nicotine and cocaine". Science. 275 (5296): 83–86. doi:10.1126/science.275.5296.83. PMID 8974398. ^ Wonnacott, S. (1997). "Presynaptic nicotinic ACh receptors". Trends in Neurosciences. 20 (2): 92–8. doi:10.1016/S0166-2236(96)10073-4. PMID 9023878. ^ Pontieri, F. E.; Tanda, G.; Orzi, F.; Di Chiara, G. D. (1996). "Effects of nicotine on the nucleus accumbens and similarity to those of addictive drugs". Nature. 382 (6588): 255–257. Bibcode:1996Natur.382..255P. doi:10.1038/382255a0. PMID 8717040. ^ Guinan, M. E.; Portas, M. R.; Hill, H. R. (1979). "The candida precipitin test in an immunosuppressed population". Cancer. 43 (1): 299–302. doi:10.1002/1097-0142(197901)43:1<299::AID-CNCR2820430143>3.0.CO;2-D. PMID 761168. ^ Talhout, R.; Opperhuizen, A.; Van Amsterdam, J. G. C. (October 2007). "Role of acetaldehyde in tobacco smoke addiction". European Neuropsychopharmacology. 17 (10): 627–636. doi:10.1016/j.euroneuro.2007.02.013. ISSN 0924-977X. PMID 17382522. ^ Shoaib, M.; Lowe, A.; Williams, S. (2004). "Imaging localised dynamic changes in the nucleus accumbens following nicotine withdrawal in rats". NeuroImage. 22 (2): 847–854. doi:10.1016/j.neuroimage.2004.01.026. PMID 15193614. ^ a b Guindon, G. Emmanuel; Boisclair, David (2003). "Past, current and future trends in tobacco use" (PDF). Washington DC: The International Bank for Reconstruction and Development / The World Bank: 13–16. Retrieved 22 March 2009. ^ Peto, Richard; Lopez, Alan D; Boreham, Jillian; Thun, Michael (2006). "Mortality from Smoking in Developed Countries 1950–2000: indirect estimates from national vital statistics" (PDF). Oxford University Press: 9. Archived from the original (PDF) on 24 February 2005. Retrieved 22 March 2009. ^ Centers for Disease Control and Prevention (CDC) (2009). "Cigarette smoking among adults and trends in smoking cessation – United States, 2008" (Full free text). MMWR. Morbidity and Mortality Weekly Report. 58 (44): 1227–1232. PMID 19910909. ^ a b "WHO/WPRO-Tobacco Fact sheet". World Health Organization Regional Office for the Western Pacific. 29 May 2007. Archived from the original on 7 February 2009. Retrieved 1 January 2009. ^ "Smoking causes one in 10 deaths worldwide, study shows". BBC News. 6 April 2017. Retrieved 11 April 2017. ^ Gay, Peter (1988). 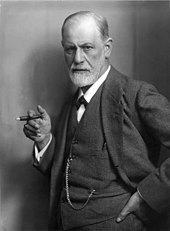 Freud: A Life for Our Time. New York: W. W. Norton & Company. pp. 650–651. ISBN 978-0-393-32861-5. ^ Patton G. C.; Hibbert M.; Rosier M. J.; Carlin J. B.; Caust J.; Bowes G. (1996). "Is smoking associated with depression and anxiety in teenagers?". American Journal of Public Health. 86 (2): 225–230. doi:10.2105/ajph.86.2.225. PMC 1380332. PMID 8633740. ^ Stanton, W.; Silva, P. A. (1992). 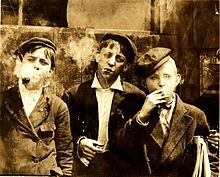 "A longitudinal study of the influence of parents and friends on children's initiation of smoking". Journal of Applied Developmental Psychology. 13 (4): 423–434. doi:10.1016/0193-3973(92)90010-F.
^ Harris, Judith Rich; Pinker, Steven (4 September 1998). "The nurture assumption: why children turn out the way they do". Simon and Schuster. ISBN 978-0-684-84409-1. Retrieved 22 March 2009. ^ Chassin, L.; Presson, C.; Rose, J.; Sherman, S. J.; Prost, J. (2002). "Parental Smoking Cessation and Adolescent Smoking". Journal of Pediatric Psychology. 27 (6): 485–496. doi:10.1093/jpepsy/27.6.485. PMID 12177249. ^ Proescholdbell, R. J.; Chassin, L.; MacKinnon, D. P. (2000). "Home smoking restrictions and adolescent smoking". Nicotine & Tobacco Research. 2 (2): 159–167. doi:10.1080/713688125. ^ Urberg, K.; Shyu, S. J.; Liang, J. (1990). "Peer influence in adolescent cigarette smoking". Addictive Behaviors. 15 (3): 247–255. doi:10.1016/0306-4603(90)90067-8. PMID 2378284. ^ Michell L, West P (1996). "Peer pressure to smoke: the meaning depends on the method". Health Education Research. 11 (1): 39–49. doi:10.1093/her/11.1.39. ^ Barber, J.; Bolitho, F.; Bertrand, L. (1999). "The Predictors of Adolescent Smoking". Journal of Social Service Research. 26 (1): 51–66. doi:10.1300/J079v26n01_03. ^ Berlin, I.; Singleton, E. G.; Pedarriosse, A. M.; Lancrenon, S.; Rames, A.; Aubin, H. J.; Niaura, R. (2003). "The Modified Reasons for Smoking Scale: factorial structure, gender effects and relationship with nicotine dependence and smoking cessation in French smokers". Addiction. 98 (11): 1575–1583. doi:10.1046/j.1360-0443.2003.00523.x. PMID 14616184. ^ "Nicotine". Imperial College London. Retrieved 22 March 2009. ^ Chandra, S.; Chaloupka, F. J. (2003). "Seasonality in cigarette sales: patterns and implications for tobacco control". Tobacco Control. 12 (1): 105–107. doi:10.1136/tc.12.1.105. PMC 1759100. PMID 12612375. ^ Chandra, S.; Shiffman, S.; Scharf, M.; Dang, Q.; Shadel, G. (February 2007). "Daily smoking patterns, their determinants, and implications for quitting". Experimental and Clinical Psychopharmacology. 15 (1): 67–80. doi:10.1037/1064-1297.15.1.67. ISSN 1064-1297. PMID 17295586. ^ a b "Cigarettes Cost U.S. $7 Per Pack Sold, Study Says". 12 April 2002. Retrieved 29 February 2016. ^ a b "USATODAY.com – Study: Cigarettes cost families, society $41 per pack". Retrieved 29 February 2016. ^ a b "Public Finance Balance of Smoking in the Czech Republic". Archived from the original on 19 July 2006. ^ "Snuff the Facts". Archived from the original on 20 December 2006. ^ "ASH > Action on Smoking & Health". www.ash.org. Retrieved 16 November 2016. ^ Kumar, Vinay; Abbas, Abul K.; Fausto, Nelson; Mitchell, Richard (18 May 2007). "Chapter 8: Environmental and Nutritional Diseases". Robbins Basic Pathology (8th ed.). Philadelphia: W.B. Saunders. p. 288, Figure 8–6. ISBN 978-1-4160-2973-1. ^ Dreyer, L et al. (1997) Tobacco Smoking. APMIS Inc.
^ Talhout R, Schulz T, Florek E, van Benthem J, Wester P, Opperhuizen A (2011). "Hazardous compounds in tobacco smoke". Int J Environ Res Public Health. 8 (2): 613–28. doi:10.3390/ijerph8020613. PMC 3084482. PMID 21556207. ^ Cunningham FH, Fiebelkorn S, Johnson M, Meredith C (2011). "A novel application of the Margin of Exposure approach: segregation of tobacco smoke toxicants". Food Chem. Toxicol. 49 (11): 2921–33. doi:10.1016/j.fct.2011.07.019. PMID 21802474. ^ Liu XY, Zhu MX, Xie JP (2010). "Mutagenicity of acrolein and acrolein-induced DNA adducts". Toxicol. Mech. Methods. 20 (1): 36–44. doi:10.3109/15376510903530845. PMID 20158384. ^ Speit G, Merk O (2002). "Evaluation of mutagenic effects of formaldehyde in vitro: detection of crosslinks and mutations in mouse lymphoma cells". Mutagenesis. 17 (3): 183–7. doi:10.1093/mutage/17.3.183. PMID 11971987. ^ Pu X, Kamendulis LM, Klaunig JE (2009). "Acrylonitrile-induced oxidative stress and oxidative DNA damage in male Sprague-Dawley rats". Toxicol. Sci. 111 (1): 64–71. doi:10.1093/toxsci/kfp133. PMC 2726299. PMID 19546159. ^ Koturbash I, Scherhag A, Sorrentino J, Sexton K, Bodnar W, Swenberg JA, Beland FA, Pardo-Manuel Devillena F, Rusyn I, Pogribny IP (2011). "Epigenetic mechanisms of mouse interstrain variability in genotoxicity of the environmental toxicant 1,3-butadiene". Toxicol. Sci. 122 (2): 448–56. doi:10.1093/toxsci/kfr133. PMC 3155089. PMID 21602187. ^ Garcia CC, Angeli JP, Freitas FP, Gomes OF, de Oliveira TF, Loureiro AP, Di Mascio P, Medeiros MH (2011). "[13C2]-Acetaldehyde promotes unequivocal formation of 1,N2-propano-2'-deoxyguanosine in human cells". J. Am. Chem. Soc. 133 (24): 9140–3. doi:10.1021/ja2004686. PMID 21604744. ^ Tompkins EM, McLuckie KI, Jones DJ, Farmer PB, Brown K (2009). "Mutagenicity of DNA adducts derived from ethylene oxide exposure in the pSP189 shuttle vector replicated in human Ad293 cells". Mutat. Res. 678 (2): 129–37. doi:10.1016/j.mrgentox.2009.05.011. PMID 19477295. ^ Fabiani R, Rosignoli P, De Bartolomeo A, Fuccelli R, Morozzi G (2007). "DNA-damaging ability of isoprene and isoprene mono-epoxide (EPOX I) in human cells evaluated with the comet assay". Mutat. Res. 629 (1): 7–13. doi:10.1016/j.mrgentox.2006.12.007. PMID 17317274. ^ Rom O, Kaisari S, Aizenbud D, Reznick AZ (2013). "Cigarette smoke and muscle catabolism in C2 myotubes". Mech Ageing Dev. 134 (1–2): 24–34. doi:10.1016/j.mad.2012.11.004. PMID 23262287. ^ "Nicotine: A Powerful Addiction Archived 1 May 2009 at the Wayback Machine." Centers for Disease Control and Prevention. ^ Peto Richard; Darby Sarah; Deo Harz; et al. (2000). "Smoking, smoking cessation, and lung cancer in the UK since 1950: combination of national statistics with two case-control studies". The BMJ. 321 (7257): 323–329. doi:10.1136/bmj.321.7257.323. PMC 27446. PMID 10926586. ^ "Cigarette Smoking Among Adults --- United States, 2006". Retrieved 29 February 2016. ^ Gurillo, Pedro; Jauhar, Sameer; Murray, Robin M; MacCabe, James H (July 2015). "Does tobacco use cause psychosis? Systematic review and meta-analysis". The Lancet Psychiatry. 2 (8): 718–725. doi:10.1016/S2215-0366(15)00152-2. PMC 4698800. PMID 26249303. ^ Nicolosi Alfredo; et al. (2003). "Epidemiology of erectile dysfunction in four countries: cross-national study of the prevalence and correlates of erectile dysfunction". Urology. 61 (1): 201–206. doi:10.1016/s0090-4295(02)02102-7. ^ Church of Jesus Christ of Latter-day Saints (2009). "Obey the Word of Wisdom". Basic Beliefs – The Commandments. Archived from the original on 4 September 2015. Retrieved 15 October 2009. ^ "Why is smoking not strictly forbidden in Islam?". Archived from the original on 3 May 2014. Retrieved 2 May 2014. ^ Smith, Peter (2000). "smoking". A concise encyclopedia of the Bahá'í Faith. Oxford: Oneworld Publications. p. 323. ISBN 978-1-85168-184-6. ^ "Global Effects of Smoking, of Quitting, and of Taxing Tobacco" (PDF). ^ "Reducing Tobacco Use". Retrieved 29 February 2016. ^ "Higher cigarette prices influence cigarette purchase patterns". Retrieved 29 February 2016. ^ "TTB – Tax Audit Division – Tax and Fee Rates". Archived from the original on 26 February 2016. Retrieved 29 February 2016. ^ Helen C. Alvarez. "You and Cigarettes". Retrieved 29 February 2016. ^ "Cigarette Prices 2007". E-Sheesh. Archived from the original on 17 April 2016. Retrieved 29 February 2016. ^ "Tobacco Smuggling & Crossborder Shopping " Tobacco Manufacturers' Association". Archived from the original on 8 September 2008. Retrieved 29 February 2016. ^ Scollo, Michelle (2008). "13.2 Tobacco taxes in Australia". Tobacco in Australia. Cancer Council Victoria. Retrieved 29 July 2010. ^ "History of Tobacco Regulation*". Retrieved 29 February 2016. ^ "Phil Taylor's Papers " Index". Retrieved 29 February 2016. ^ "Tobacco Sales Law". Retrieved 29 February 2016. ^ Ahlfeldt, G., Maennig, W. (2010), Impact of non-smoking ordinances on hospitality revenues: The case of Germany, in Journal of Economics and Statistics, 230(5), 506–521; preliminary version in: Hamburg Contemporary Discussion Papers N° 26, http://www.uni-hamburg.de/economicpolicy/hced.html. ^ "NFPA applauds Reynolds American Inc". Archived from the original on 1 March 2013. Retrieved 29 February 2016. ^ "NFPA" (PDF). Archived from the original (PDF) on 20 November 2007. Retrieved 29 February 2016. ^ a b "Coalition for Fire-Safe Cigarettes". Retrieved 29 February 2016. ^ C. Merrill, J.; Kleber, H. D.; Shwartz, M.; Liu, H.; Lewis, S. R. (1999). "Cigarettes, alcohol, marijuana, other risk behaviors, and American youth". Drug and Alcohol Dependence. 56 (3): 205–212. doi:10.1016/S0376-8716(99)00034-4. PMID 10529022. ^ Swan, G. C.; Carmelli, D.; Rosenman, R. H.; Fabsitz, R. R.; Christian, J. C. (1990). "Smoking and alcohol consumption in adult male twins: genetic heritability and shared environmental influences" (Free full text). Journal of Substance Abuse. 2 (1): 39–50. doi:10.1016/S0899-3289(05)80044-6. ISSN 0899-3289. PMID 2136102. ^ Rohsenow, Damaris J.; Martin, Rosemarie A.; Tidey, Jennifer W.; Colby, Suzanne M.; Monti, Peter M. (2017). "Treating Smokers in Substance Treatment With Contingent Vouchers, Nicotine Replacement and Brief Advice Adapted for Sobriety Settings". Journal of Substance Abuse Treatment. 72: 72–79. doi:10.1016/j.jsat.2016.08.012. PMC 5154824. PMID 27658756. ^ Tang, Yi-Yuan; Tang, Rongxiang; Posner, Michael I. (2016). "Mindfulness meditation improves emotion regulation and reduces drug abuse". Drug and Alcohol Dependence. 163: S13–S18. doi:10.1016/j.drugalcdep.2015.11.041. PMID 27306725. ^ Rosen, Laura J.; Galili, Tal; Kott, Jeffrey; Goodman, Mark; Freedman, Laurence S. (2018). "Diminishing benefit of smoking cessation medications during the first year: a meta-analysis of randomized controlled trials". Addiction. 113 (5): 805–816. doi:10.1111/add.14134. ISSN 0965-2140. PMID 29377409. Gilman, Sander L.; Xun, Zhou (15 August 2004). "Smoke: A Global History of Smoking". Reaktion Books. ISBN 978-1-86189-200-3. Retrieved 22 March 2009. Proctor, Robert N. (15 November 2000). "The Nazi War on Cancer". Princeton University Press. ISBN 978-0-691-07051-3. Retrieved 22 March 2009. World Health Organization (2008). The Global Burden of Disease 2004 Update (PDF). World Health Organization. ISBN 978-92-4-156371-0. Retrieved 1 January 2008. World Health Organization (2008). WHO Report on the Global Tobacco Epidemic, 2008: the MPOWER package (PDF). World Health Organization. ISBN 978-92-4-159628-2. Retrieved 1 January 2008.